-Contributed by Francisca Ugalde and Cathy Faye. On May 6th, a new exhibition will be installed at the CHP. 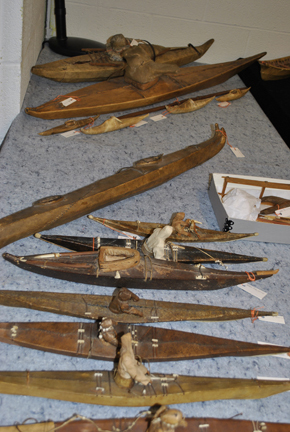 The exhibit, Connecting Objects to their People: From the Arctic to Arizona, highlights Native American ethnographic objects from the Jim and Vanita Oelschlager Collection. The exhibit will consist of more than 100 ethnographic items from four different regions, featuring cultural objects that are both artistic representations and objects for everyday living. Four traditional cultural regions will be represented: the Arctic/subarctic, the Northwest Coast, the Great Basin, and the Southwest. The exhibit is co-sponsored by the Department of Anthropology and Classical Studies, the Myers School of Art, and the Center for the History of Psychology. 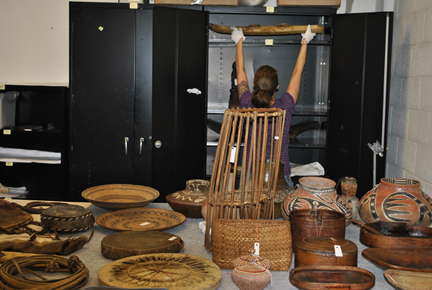 Check out the photos and captions below to see UA students, faculty, and staff cataloging and storing the objects and preparing them for exhibition! Then come see it in person! (For more information, see our website). Rachel unpacks objects from boxes. Upon the arrival of the objects from the donors home, we had to open all boxes and account for every single object, double-checking that they all had arrived safe and sound. Rachel carefully places objects into the research storage cabinets. At this stage of the project we are taking objects out of their permanent storage and placing them in our research space for easy access. All objects have been tagged, photographed, measured and researched. And the information is saved on our inventory. Objects are displayed for one of the various research visits. 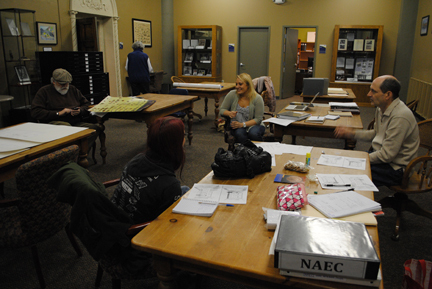 The research team invited a number of scholars to come take a look at our objects and offer us information. This became a great tool in the research process. 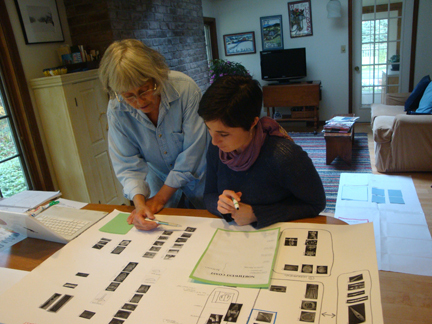 Lynn and Fran working on the exhibition groupings. Once the initial research was established, we had to make a decision as to which objects would be in the exhibition. One of many work meetings inthe Center for the History of Psychology's Reading Room...with Chuck Ayers, Erica Thompson, Rod Bengston, Rachel Fox, and Lynn Metzger (Francisca Ugalde is behind the camera). These meetings were a confluence of all the departments and individuals involved in this project. Rod Bengston shows the exhibition space mock-up to CHP Coordinator, Dorothy Gruich. 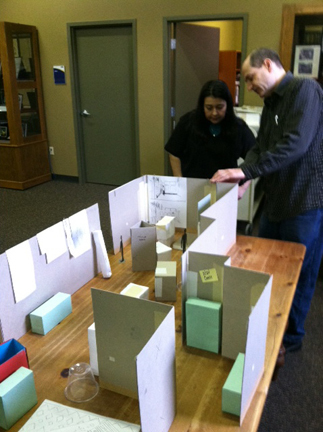 The mock-up is an essential tool in the exhibition planning process. 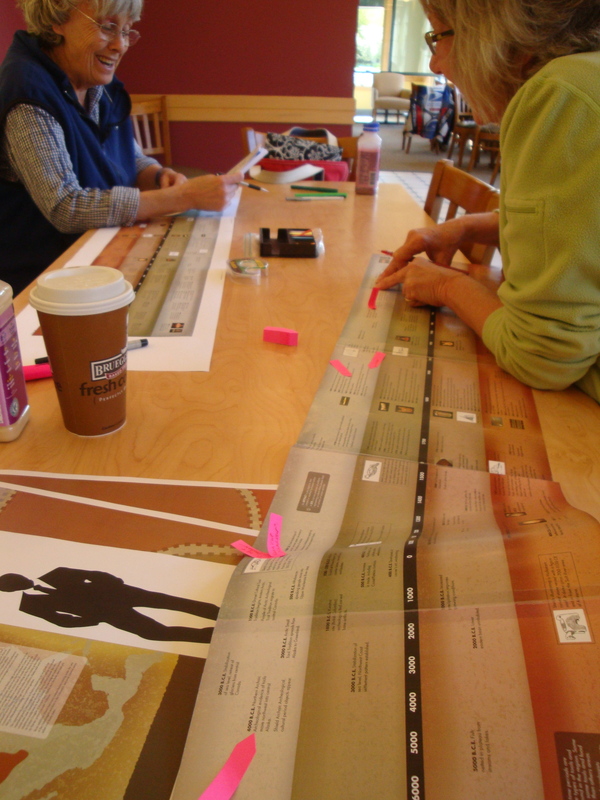 Timeline-proofing session with Peg Bobel and Lynn Metzger. This was round three of proofing these before they went into production. Sounds easier said than done, but we did it! 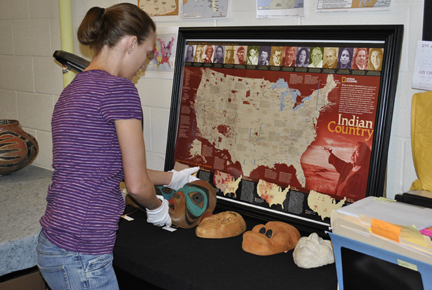 Come check out the finished product in person at the Center for the History of Psychology! The opening reception is May 6th from 1-4 and the exhibit will be open until October 14th, 2012. Admission is free. Read more about the exhibit here. In the 1940s, Robert Waldrop was in the middle of his graduate work in psychology at the University of Chicago. There, he worked with L.L. Thurstone and was fascinated by the work of a new assistant professor in the department, William Sheldon. 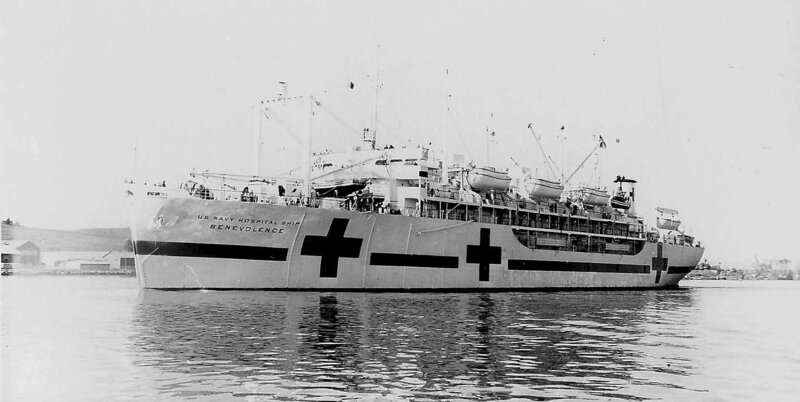 However, as the war in Europe progressed, he signed up to serve as chaplain on the USS Benevolence, a Navy hospital ship (pictured below) that departed for the Pacific in 1945. The crew of the Benevolence would eventually experience the Japanese surrender and the liberation of prisoners of war. After serving three tours of duty with the United State Navy, Waldrop completed his graduate education in psychol­ogy and went on to become a central figure in the development of counseling psychology. He received his Ph.D. from the University of Michigan in 1948. Dr. Waldrop went to work for the Veterans Admin­istration where he developed the counseling service in the Department of Medicine and Surgery. His work was funda­mental to the creation of counseling psychology doctoral training programs across the United States. Recently, CHP director Dr. David Baker sat down with Waldrop and asked him to recall his experiences on the USS Benevolence during the Second World War. The recording of that conversation is available here.